Podcasting Lessons Learned are the most important part of the process. We all start podcasting somewhere, but I decided to share my podcasting lessons learned along my podcasting journey. A bit of a disclaimer first, this is not a Podcasting 101 course, so some items I will mention, but not go into complete depth. I will leave that to the Podcasting Gurus; Daniel J. Lewis (The Audacity to Podcast), Dave Jackson (School of Podcasting) Ray Ortega (Podcasting Roundtable) and others to discuss those subjects in more depth. Oh, one more disclaimer, as time marches forward, Social Media platforms will come and go, so I will try to talk more general in themes (that hopefully) will be applicable on any new platforms that we haven’t even seen at the time of this Blog post. Before we begin, I want to say something important. If you are a current podcaster, I want these points to encourage you. If you have never been a podcaster, I want to share something with you right now. So, to all you non-podcasters – look at your thumb. Go ahead, look at it. Your thumb-print is unique and so are you. Your life path, experiences and your point of view is different than anyone else’s, and we need to hear from you. If you need a reason to podcast it’s this – you are unique and special. As we go through this list and you’ve never thought about podcasting, I hope you will get some more intermediate and advanced tips and ideas to help you along the way. A podcast takes a lot of work. Read that again. Read it one more time. Lots of popular podcasters make it look easy, but it’s not. Now, I’m not trying to squash your podcasting dreams. I’m trying to give you the truths I learned (much later) – up front, so you know what to expect ahead of time. Podcasting is a tough gig. It takes more time, energy, money, emotional investment than anything you can think of. We’ll leave that here for now, but if you stop reading (or listening to this podcast episode) before the end, at least you’ll know this fact. 1. Was that I was the sort of funny banter guy and she was the well-read, well-studied Disney, Fairy Tale, etc fan, 2. I figured the listeners would appreciate 2 different voices discussing the show, 3. She would save me when I (often) forgot a name of an actor that came up in an off-the-cuff comment (Note: Always prep well before recording. True Off-the-Cuff recording in a TV Fan Podcast can result in many edits and re-recording of clarifications, etc. Prep, Prep, Prep). The OUAT Fan Podcast would not have been listenable without Colleen as a co-host. Toward the end, Colleen and my schedule (and other factors) could not handle the continued production of the podcast, so we ceased production. It was a decision with lots of BTS discussions. Understand that a husband and wife co-host duo can be a strain on a marriage unless it is totally aligned. I’m not overstating anything. I’m saying that many times it was a priority to me and Colleen reminded me of a marriage takes priority over a podcast. 3. To Niche, or Not to Niche? One of the easiest podcasts to create (I know, I’ve done a few) is to podcast about ‘whatever you want to talk about’, but unless you are a well-schooled personality about a myriad of subjects, it will be difficult to grow an audience. A niche audience is a fine-tuned, focused audience that likes one topic. Even a portion of one topic. The more precise your topic, the more niche your audience can be. I know you don’t believe me, but it’s true. Let’s keep going and you’ll see another good friend of the niche topic podcast. 4. What’s in a (Podcast) Name? When we started our Once Upon a Time Podcast, we didn’t consider that others would do podcasts about the TV show, too, so we bought the domain http://onceuponatimepodcast.com and because of that, named our podcast the verbiage of the domain name. We were early and got, what we thought was the perfect name for Google to place as the top of the search results. Little did I know that as time went on, others would start podcasts about the topic (in this case, the TV show, “Once Upon a Time”), so I added ‘Fan’ to the name to set it apart from the others. It was actually a great move because ABC created the “Official” Once Upon a Time podcast, so the other podcasters (hopefully) added the ‘unofficial’ to the name and/or subtitle of the OUAT podcasts. It is very easy to create graphics (for Blog Posts or Itunes) that are exactly like the (in this example) TV Show you are doing a podcast for, but you shouldn’t. A podcaster I know was contacted by a lawyer for the network and asked for the podcaster to change the Itunes podcast art to differentiate it from the actual graphic for (in this case) the show. Bonus tip: I wouldn’t use the show musical theme in your podcast (Even though I did for the first season of my podcast…). We’ll not be talking about you promoting your podcast now, but this is about using another entity’s promotion activity. Specifically, a TV network (This could be any other similar entity, as well). TV networks have money and access to a myriad of ways to promote their TV shows, stars, etc. Even though you don’t, you can use their money and promotion to send people to your podcast. This is one of the main gifts of doing a niche podcast about a TV show, the budget of the network (or in the case of a movie, a movie studio) is a silent member of your podcast crew. The nice thing is – they work for free; posting ads on Social Media platforms, signs all over town, book the cast on talk shows and news shows, etc. – A textual representation of the audio file. What, what? You ask. I know. The name is a bit deceiving. Podcast (to most people) represents the audio portion of it, but Google (or whatever search engine that will crawl through your Blog post in the future) does NOT pull all the words out of your audio file and list it out for those searching for your great episode in the future. You’ve got to do the hard work of typing out the textual representation of the audio portion of the podcast for Google to easily crawl as be accessible to searchers in the future. That was one of the biggest shocks to me is that I was focusing on the recording of the audio, but I came to realize the importance of the text portion of it. Not many podcasters talk about the importance and specifics of show notes (Some do, sure, but…). The mics get most of the focus from the gurus, but I promise you – the text is as or more important. One of the (to me) worst parts of podcasting was editing. I loathed it. So much so that I found a way to not edit unless I had to. I came to accept that the sound of me taking breaths was proof that I was alive, so I let the worry of editing of that – go. The only time I edited was if I said something completely wrong or would incite a riot with the fandom. In my quest to not edit, I decided to record the podcast episodes “live” or add in the intros, outros, bumpers, etc. This was a game changer for us. To me, it added more of a “live TV” element to recording a podcast episode. I found a few (Yes, a few) soundboard programs (1 is Soundboard 2.4 (Now free here > http://www.xnapid.com/)) and loaded them up the intros, outros, sound effects, bumpers, etc and that was a great addition to my podcast bag of tricks. Note: I could record from all the sounds played from my sound card, but I believe that newer sound cards won’t allow that, so you may want to use Smartphone apps to play intros, outros, bumpers, sound effects, etc. There are some instances that filler words can be part of someone’s personality, but most of the time using “Um,” “Uh,” “Ya know,” etc seems like the speaker doesn’t really know what they’re saying and trying to not get to the point. I think it causes the listener to be frustrated while they listen to you, and we don’t want that, do we? The way I had to practice not using filler words was to be okay with silence. I think we as podcasters want to fill up all the silence with “ums,” “uhs,” and other filler words, but pauses (while we think of the next word(s) to say) actually cause the listener to connect with us and fosters an anticipation of what is the next part of what we will discuss. Podcasts normally get a bad rap when discussed by conventional “PR” or “Media outlets”. The listeners/readers/likers/followers of blogs/podcasts/Social Media accounts more than likely are dwarfed by the numbers of listeners (that can be rarely verified, btw) Radio stations, or viewers TV news stations, etc, but never let the Goliaths of media make you feel like you are not important. You are a VERY important (I would say even vital) component to spreading the word about your topic. Whether you know it or not – or believe it or not – YOU ARE A VITAL PART OF THE MEDIA. DO NOT let companies or entities make you feel devalued because you don’t have millions of content consumers. You reach pockets of listeners/viewers/readers/Social Media that big Media can’t. They are using old-school methods to reach an audience – you are using new tools to reach a new audience. True be told, most of the time, the red carpet won’t be rolled out for you and you won’t be handed Press Passes for every convention and event you want to cover for your topic. Never forget that you are an important part of the Media. The term New Media is thrown around a lot but use it. You are in the New Media, covering a topic to a new audience. Be Bold, Be Creative, Go forth and do great things in your space. Most podcast gurus talk about the audio portion of the podcast, but the textual part – the Show Notes, are more important. The reason is that Google cannot extract text from your mp3 file. If you want to become a news site for a particular site, focus on building your audience, first. I know this seems obvious, but if you want to get access to photos, press releases, and other items via the network/studio (Here is the ABC Network media contact https://www.disneyabcpress.com/abc/contacts/ (Notice the Register and Login link on the upper right corner of the page)), numbers are important to them. If you want to be known as a News site, remember as you create your site for your blog/podcast to specify that you will be covering news of the topic of your blog/podcast. Once that is done, the hard work begins. Grow your audience. There are no quick ways to do this. Each blog post and/or podcast episode is a chapter in your story as a content creator. Learn and grow with each chapter. Content consumers are the lifeblood of your content, but their interest can come and go. Not all will stick with you from the beginning to the end. Heck, your interest may not last from the beginning to the end. Ours didn’t. ** What will you do if your interest wanes to the point of wanting to quit? Greetings from Storybrooke (http://www.greetingsfromstorybrooke.com/) handed off the hosting from the original hosts (Bill and Anne Marie) to new hosts to finish out the show. If you do a “whatever I want to talk about” podcast (Like I’ve done), it’s hard to keep coming up with subjects and content for upcoming podcast episodes. The beauty of creating a podcast about a TV show is that the network’s job is to create new content on a seasonal basis – which is a win-win for you. More for you to talk about! 16. What are you leaving with your Content Consumers? Connected themes that are Timeless? Make sure that part of your content is Evergreen or Timeless! If applicable, use emotion in your content. Not necessarily anger, but positive emotion. For the OUAT Fan Podcast, we used BigLove – A love that is so big, you can’t keep it all. Take what you need and pass it on. We were doing our best to calm the fandom down. Use your platform for the influence of good. What is the heart of your content? Don’t forget to include and leave the heart of your content with your content consumers. Initially, the fans were fans of the show, but as time went on, the fandom split into subgroups of ships (pairing up characters together (and other subgroups followed)) and then the in-fighting began. That’s when it started to not be fun. A fandom that loves something can be a great force of good. A fandom that splinters and attacks each other, the cast, crew, etc is never good. If you didn’t follow one subgroups thought or another, the fans can turn on you. The wave of disgruntled fans on Social Media can be overwhelming. 19. Should you have spots for your content on Social Media? In the olden days, we would get spots for on content on every Social Media platform to spread the word, but with the rise of the finicky fandom, is it still worth it to keep up with all the new Social Media platforms to spread the word about your content? You need thick skin. Really, thick skin. You can’t take opinions and feedback so personal, that it affects you. Your experience is probably not the experience of all your listeners. Maybe they’ve had a bad day, maybe they’re ill, maybe they’re in a bad living situation, etc. I replied to a listener that lambasted me in an email, and they replied that they were sorry and was having a bad time in their life. When you get a great iTunes review, a great email with comments that make you feel good – keep it. Put them in a file, put them on your computer wallpaper or put them on your wall. Keep and treasure the good feedback. You will need to come back to it. There will be times that the bad feedback or bad situations will pound at you like a storm, trying to wear you down. The collection of good feedback items will remind you that what you are doing is worth it. You WILL need to revisit that from time to time. I promise. What to do when the waves of negative feedback come? We will cover that next. We discussed the need for thick skin as a necessity of creating content, but now let’s take a closer look at this. As stated before, negative feedback will come to you. Especially now with the immediacy of Social Media (and the anonymity that comes with it). A. Take all of it to yourself, obsess about it, and let it dictate and rule the production of your content – PLEASE DON’T DO THAT. You are in full control of the DNA of your show. Remember, only you know what your content should look like at the end of the day. Part III – Get rid of the negative feedback. Don’t focus, obsess or revisit it (except for the applicable parts). If you change your content based on every bit of negative feedback, you will lose your direction, get out of touch with your DNA and in time, lose the interest of the rest of your content consumers. It’s really all about percentages, If you get around 10% negative feedback, be thankful that they took the time to actually leave an Itunes review or negative comment or negative email. It’s hard, but thank them for caring enough to share their feelings. It may sound counterproductive, but the bottom line is that these content consumers just want to be heard. All you need to say is that “We hear you and are taking it under consideration”. One of the biggest things is to try and diffuse the anger sent with the negative feedback. You don’t know the situation that the person is in that sent the negative feedback. Do your best to listen and diffuse the negative emotion. It’s tough, but if you can – you have used your content platform for good. One more thing is that if a podcast has all 5-star reviews, that’s not reality. Based on what we said before, not everyone will love a particular podcast – or a particular season or an episode of a podcast. Oh, one more thing – Try to not let a content consumer try and hold your content hostage for a good or modified bit of feedback. Some content consumers will say, “If you change this or that to meet my approval, then I will leave an updated (better) comment or updated (better) star rating, but guess what – they normally forget. Remember, emotions fade and people go on with their lives. Review the steps ahead and hold on tight to your content DNA. You will know when to adjust your DNA if you need to, but not because of one negative bit of feedback. We all feel upset or emotional about a situation, but sometimes those moments fade. You may feel that way at the moment, but it fades. Try to sift your feelings down to the ones you want to be known for, not that you feel moment to moment. Remember, podcasting and blogging are a legacy you are building post by post. Try to build a great legacy that will stand for all time, not just for a moment. These ccs live entirely on Itunes (or other podcast consuming apps). They probably won’t go to your website/read your show notes/follow you on a Social Media platform. Believe it or not, there are some ccs that will rarely use Itunes and mainly go to your website and consume your content. One more variation. Some will connect with you on Social Media platforms and consume your content via shortened links. Obviously, some will mix those main ccs, but understand that not all ccs are created equal. Like it or not, podcast still has a stigma in certain areas, but adding the word ‘radio’ or ‘show’ may get you into doors the word ‘podcast’ may keep you out of. I’ll bet you don’t have an enormous ad budget to pay for ads on all the conventions, magazines, etc in your topic area. Great, I’m talking to the right people here. Just because you can’t put your content name, elevator pitch and url in front of many eyeballs to entice them to check it out – you can create your own ad with the idea behind it that will have people coming back day after day (If you do this daily) and actually looking forward to it. First, what I did. I use Canva to create questions/scenarios for people to answer, like ‘Name a song with ‘night’ in the title’, then I put the name of the website I am promoting (Right now it’s http://menaredumb.org). I change it just about every day. Depending on the question/scenario, I get a pretty good number of people participating – which means they all have had to see the url of my next project. The key is that people love to answer questions and compete/show how smart they are – especially in public. – Uber Players. People (even though I state ‘Name a (meaning one)…’) will name as many songs that they can think of in that scenario. These are the uber players, so that definitely helps the spread of my song game meme. Namely, the more comments, the more new people will want to participate. – Enforcers. People who will correct others with their answers. Most of the time, people will participate for fun, but some take it very seriously and enforce the actual name of the song, etc. Within reason (I’ve almost messaged certain people to chill on this, but it hasn’t got too far out of hand), this builds the interactivity to a deeper level where people don’t just leave an answer and bail, but they read all the answers and participate further. There are more, but I want you to see that building a song game meme can work on Facebook and build a community around psychological triggers that people react to. AND THEN – you place your ad, on your song game meme. For free. My belief is that this works best on Facebook (with the post set to ‘Public’, btw – to cast it out to everyone). I mean, in a scaled down way (maybe using hashtags), Twitter might work as well, but I’ve stuck with FB on this. I also encourage people to share this on FB, but I haven’t had much luck with that. I’m not here to suggest a way to find the best SEO terms to use, but SEO terms and the proper use of them still matter. I say that because we had a number of content consumers that found us via Search Engines. your website URL (This will let you know when anyone adds your URL to a blog post about your content). *Be sure to add any new cast members as they join the show. This is a very powerful tool to stay up with news about (in this case) the TV show you are creating contact about. I call it DNA, but it is the way you will be covering your topic. For instance, there are many blogs/contents about Disney, Star Wars, etc. If you start one that’s just about a popular topic without establishing your DNA for it, it probably won’t get noticed. The DNA for our OUAT Fan Podcast was through a married couple’s lens, connecting to other movies, TV shows, ideas like Joseph Campbell’s ‘The Hero’s Journey’, etc. We also tried to connect with the fans and represent the fans (Thus, the podcast name) when we attend events. The more different your DNA is, the better. You may need to adjust your DNA as you begin, but do your best to not let bad feedback control and manipulate your DNA. We did things like recraft new Intros, Outros, Bumpers and Itunes Album Art during some of the later OUAT seasons. I knew that it was working when someone knew us by the Pirate OUAT podcast (That was our 3rd Season recrafting). We even created funny comedy bits that we played during our live shows (more on that later). Cover your topic, but find a DNA that is you. Adjust if YOU need to. Defend it at all costs. 30. Branch out to multiple shows a week? Initially, we podcasted on a night that was convenient for us, but then I remembered that Cliff Ravenscraft did an ‘instant feedback’ podcast episode for Lost and we added another weekly episode recorded directly after the West Coast airing of the OUAT episode. Even though you might see the worth (and interest) in it, adding another episode will add more work for you (obviously), so weigh that decision carefully. 31. If you do cover a TV show with content, should you take a hiatus when the show does? Locking into a weekly podcast can be a rough road. My suggestion is to give yourself a break and take some time off (Summer, Winter holidays, etc). If you’re up to continue on with a weekly podcast from here on out, cool, but the key for that is to plan for a year out, at least. If you are creating content about a TV show and want to create content during the hiatus, think about what you want to do during that time; News about the TV show (cast and/or crew) updates? Specific episodes about certain cast members and their lives, filmography, etc? Do creative content that is on the edge of your topic. Since the general core of OUAT was fairy tales, some of the OUAT podcasts recreated little-known fairy tales as fan audio productions. 33. Ready to go all the way Live? We decided to do live podcasts during the show season. Again, its another episode that needs your creativity, attention, time, etc. Understand that when you open a chat room, you open it up to people that want to talk about what they want to talk about and it won’t stay on your topic. If keeping adult language off the chat, you may want to appoint a moderator to police that (including banning folks, etc). Believe me, host, moderating the chat, playing the audio intros, clips, interviewing people on the phone, keeping the topics flowing as you want them to, etc – it is a lot of work. Especially when it’s live. The bad side of competition is obvious. It challenges the Kumbayah hopes and makes other content on your topic your enemy. That sounds strong, but when you put your heart and soul (and time, and money…) into something – truth is – you want the ccs of other similar content creators to listen to yours. Truth is, even without you going to the “dark side” of competition, if you do have a niche blog/podcast (with voracious listeners), people will try them all out – and stay with (in their opinion) the best ones. There is a good side of competition. Honestly, there is. The key is always thinking about how you can give a better experience for your listeners. If your listener’s enjoyment is the center of your decisions, then that is a good use of competition. We were the number one OUAT podcast on Itunes for a while. It felt nice until we slipped from that lofty place, that’s when I decided to go for broke and take our listeners on a trip with us – to the location where they filmed OUAT (in Vancouver, B.C.). We got our enhanced licenses and drove up from SoCal to Vancouver and brought our listeners with us. We did the very first live podcast from the Steveston Hotel (while they were filming). On another trip to Vancouver, we did a Facebook Live tour of the town they filmed the show in. Those trips would never have happened if it wasn’t for the good side of competition. 35. How many Podcasting/Blogging gurus do you need? Podcasting/Blogging gurus aren’t like a spouse, you can have more than one. We all have one main guru that helps up jump in the podcasting/blogging water, and that’s great, but I encourage you to branch out to other gurus (not just podcasting/blogging, but Social Media, etc) representing other groups (like Mommie bloggers, for example) to learn from them. I stumbled upon Holly Homer and her story of how she grew her Facebook friends to 1,000,000 plus. This is a great video revealing how she did it. What I like about Holly is how she treats Social Media like a scientist. Use your SEO term in the naming of your graphics on your podcast/blog post. Google likes to see that all of the parts of the post are linked thematically (SEO term). Plus, if you include your URL on all graphics, they all become signposts to your post and your website. It’s true (well, in a sense)! The key is finding the skill that you are the best at in terms of the topic someone else is podcasting about. Once you find that skill, start sending in emails and (if requested) information to that podcast (that you really enjoy). If you continually provide information that the podcaster benefits from, at the very least you probably will get a shout out, but they could also ask you to be a part of their podcast crew. In that situation, you probably will be included as a member of the crew on the website, show notes, and shows. 2. you want to do your best to encourage (and help) a podcaster that you enjoy. The final bit of truth here – Some podcasts will be more open to accepting and mentioning your help. Some won’t. Just being real, people. This is similar to the above point but expands on it. If you have a way to record your thoughts (either by phone (if the podcast has a voicemail option) or on an audio file (preferably an mp3 file)), I would think that would be appreciated by the podcaster. We had people created fun emails and audio files that were read/played by listeners of the show. In a way, those listeners were helping to add to the show (and it wasn’t on you to create). I mentioned earlier (if you have the big audience numbers) the way to contact the network to connect. You can ask for an interview (which may or may not include access to the “interview room” in conventions like Comic-Con) during the promotion period of time for a particular show. I never got to this level, but this is great access with the blessing from the network. Getting a Press Pass is a great bonus to attending a convention like a Comic-Con, but let me explain what it means and what it doesn’t mean. Usually getting a Press Pass means you need to provide proof that you have an established blog or podcast that normally covers a topic or the particular event for 6 months or more. Seriously, they won’t give you a Press Pass for starting a blog or podcast a week before an event. In a nutshell, a Press Pass is given to a person who is vetted to be a member of the press. Sometimes, you will be given access to a press seating area during some panels and you may also be given free parking and other perks. Now, let’s talk about access to the “pool interview room”. That is totally different. Quick story, when I got my Press Pass for WonderCon in Anaheim a number of years ago, I asked where the “pool interview room for (the show I was podcasting about) was,” and the person handing approving the Press Passes had no idea. I had a hard time believing it (That they wouldn’t have been given that kind of information), but it seems to be the case. When the network approves you for access to the “pool interview room,” you will be notified which room at the venue that the cast/crew will be seated and made available for groups of interviewers for media (including very lucky (with high numbers or viewers/listeners/readers) bloggers/podcasters)). Keep in mind, if you get access to the “pool interview room,” it won’t be one-on-one, it will be a group that the network schedules through the time the cast/crew are available. Note: The cast/crew are on a very tight schedule during a convention (Scheduled Interviews, Autograph sessions, Panel appearances, etc). I have never had access to the “pool interview room,” if anyone has, please leave a comment as to your experience. So, like I said getting a Press Pass and getting access to the “pool interview room” are completely different experiences. I spoke to a press agent one time on how to get the big “star” interview and she gave me some good advice; start with the crew and build up your interview legacy. Reminder: The crew members spread the word to other crew and cast members if you ask a bunch of goofy questions if you aren’t prepared, or if you waste their time, etc, you may not get further opportunities in the future. For instance, start with the writers, producers, directors, etc. As you get more experience, it can grow into more opportunities. There are other ways, but that’s what worked for me. When you pay the fee (There is even a trial period, as well), you will be provided with the agents and contact information for celebrities. Do your homework! Read the interviewee’s Wikipedia pages (Verify the item is the truth), twitter pages, Facebook accounts, and other interviews to learn as much as you can about the person you are going to interview. Watch/Listen to interviews and if the person’s name has a different spelling, practice it. If you are still unsure, double check with the person before the interview starts on how to pronounce their name. If you are recording audio or video remotely, make sure everything is charged. Check levels before the interview and make sure everything is ready to go before you start. If you are recording at home via the phone, always let them know when you are recording. Always give them (or their press agent the opportunity for final edit approval. Some people think that the only time you can get lucky and get access to popular celebrity interviews are only if you can go to big cities like San Diego, Los Angeles, New York, and the like, but that really isn’t the case. Cast/Crew members are making appearances in conventions and expos all over the US and the world. If you do a little digging, you can find the agent assisting the cast/crew member at the expo or convention. Contact them and ask if the cast/crew members they represent will have some time for an interview during the expo/convention. If you live in a smaller town that has an expo/convention, you probably will have a better chance than someone at a Comic Con in L.A., San Diego, or New York. Google search for the cast’s favorite charities. Link hearts with the cast/crew members to charities that they feel strongly about. Promote it on your Social media platforms and in your content. Remember to use your content “voice” to promote what the cast/crew feels strongly about. 46. When should you start a podcast about a TV show? Start early, but not too early. We wa for 5 OUAT episodes OUAT before we started anything. I started with blog posts to test the waters. One of my first blog posts was on page one Google for a time. I knew we had something. 47. When should you plan a meetup for the listeners of your podcast? Strike while the iron (or show) is hot. We are fortunate enough to live near Disneyland, so holding our first meetup at Disneyland was a no-brainer. It was hotter than hell, but a great time. As podcasters, we are constantly looking for avenues of promotion for our content, but I think we forget too often that we are also an avenue of promotion for others. Your content may not be a TV (or streaming) network or radio station, but you do reach an audience thay they may miss and that means your content is valuable. A friend of mine had a youtube channel and a podcast. Because of those two streams of content, he put together a free party at a tourist location. I won’t give names, but I will say that he used his niche and audience to pitch donations of items (free or discounted) to throw a mixer in which he invited celebrities within his niche, got the room/space, got the catered food, got limo/transportation, etc. I was there and it was amazing. If you want something – ask for it. One of the two answers you get is what you want. Do your homework (Prepare to present the value you can provide the party you are asking), study up on being more persuasive. if you get a ‘No’, continue to ask further if there is anything else that can be offered – learn to negotiate better – Be ready – and ask for what you want. 51. How to get a review copy of the Blu-Ray discs of a particular TV show? Find those listeners that are providing great content on a consistent basis and ask if they would be part of your crew. Maybe they could review emails and condense them into bite-sized chunks for the show? Could they review voicemails weed out the duplicate theories/statements? Basically, they could be gathering information for the next podcast/blog post. The most fun we had is when we had listeners use a fun Twitter account for the podcast, interacting with the listeners, cast, crew, etc. The Deputies got the DNA of the show and had fun with the persona and the Twitter account. Like with anything else, the more diverse the backgrounds of your crew, the better. They will bring a glimpse of the topic that you will never have with people similar to you. Also, add diversity of men and ladies, too. This may help in the contacts you will make with the cast. Unfortunately, we worked full-time jobs as well as podcasted, so we didn’t have much time to arrange a time for cast/crew interviews, so what did we do instead? Remember how we discussed imdbPro to access cast and crew agents? I thought what would be as close (as we could get) to an interview with the cast and crew members – Voicemails. Group cast members together and email their agents here and there (Not all at once) to ask for voicemails (Provide a basic script for them, but allow them to ad-lib, as well). We were lucky enough to get many cast and crew members to leave voicemails. Start with cast members that are guest stars, then work your way to the main cast. You never know what doors will open up if you promote projects for cast members. 59. Don’t forget to promote charities of the cast, crew, show, etc. Remember as a content creator, you are a valuable part of the media. Be available to promote important charity work. Note: Have a video and mic set up for remote interviews. You never know when the opportunities will come up. Producing a podcast (or group of episodes) for another group. Colleen asked for it on Twitter. It was magical then and still is. 5. A Website Geek. You just always need one. There are many times you will feel like you are all alone in your dream-filled pursuits, but your posse will help you traverse the paths in the valleys, climb the mountain and enjoy the view of the mountain top. Thank your posse – a lot. Please share this as much as possible with podcasters, podcast gurus or those that enjoy podcasts. I am available for interviews on other podcasts. Lastly, I’m available if you need my help. If you’ve started a podcast (after visiting Dave Jackson’s The School of Podcasting) and have questions for moving forward with a entertainment based podcast, let me know. I want to help you. If you need an intro recorded, need some help with something, let me know. I may be able to help. This entry was posted in Once Upon a Time Podcast on October 7, 2018 by Admin of Storybrooke ;). 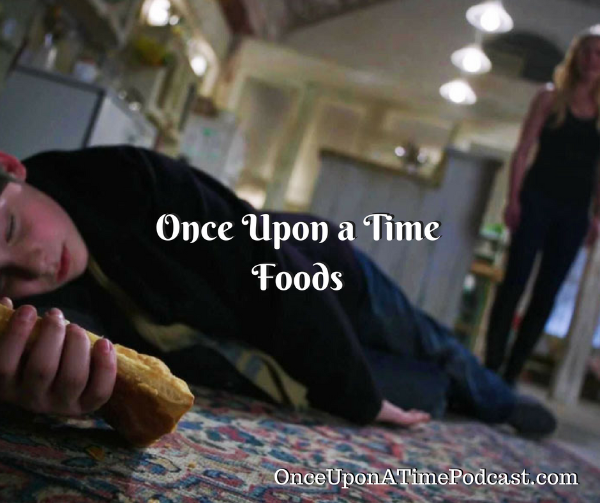 Once Upon a Time foods are often over-looked in ABC TV’s Fairy Tale drama, Once Upon a Time. Whatever magical land our storybook characters find themselves in, they must get hungry. Especially in Storybrooke, we find many foods mentioned in the show. Can you remember them all? We will list out as many as possible here. If we left some off of our list, be sure to let us know in the comments below. We want to make this the most comprehensive list of all Once Upon a Time foods anywhere. On this list, we will strictly stick to those foods seen, served or mentioned in Storybrooke. We will (try as best as we can) mention the episode that the particular food was in as well. All this talk about food is making me hungry, what about you? In OUAT episode 4X14 “Unforgiven” Charming runs into Hook and Emma going to Granny’s for a ‘Grilled Cheese’, but Charming pleads with her to help him stop Ursula and Cruella and their dastardly deeds. April 12th is National Grilled Cheese Day. The actual term “grilled cheese” doesn’t make an appearance in print until the 1960’s. Before then it was all “melted cheese” or “toasted cheese” sandwiches. The most popular additions to a grilled cheese sandwich are bacon, ham and tomato. In OUAT episode 4X13 “Unforgiven”, OUAT episode 5X01 “The Dark Swan”, OUAT episode 5X06 “The Bear and the Bow” and OUAT episode 5X08 “Birth”, Onion Rings were mentioned. Sure, I love french fries but Onion Rings “ups the ante” with a crunchy outer shell covering a vegetable. A vegetable. That’s healthy, right? My favorite place to get Onion Rings is Red Robin. It’s not just two or three, but a TOWER of Onion Rings. Granny, you might want to try this at the diner. June 22nd is National Onion Ring Day. The first recipe for Onion Rings was a Crisco ad in a 1933 issue of the New York Times Magazine. A&W is credited with popularizing the onion rings in fast food restaurants, introducing it to its menu in the 1960s. Eating parsley will help get rid of onion breath. Our journey finding more Once Upon a Time foods continues, but this next one can be dangerous. Honeycrisp Apples pack the punch of a Honeygold with the crisp of a Macoun. When I eat ice cream, I enjoy ice creams like Rocky Road, because it has stuff in it. Not only did it include Chocolate Ice Cream, but it included nuts (originally it was Almonds, but now it’s usually Walnuts) and then diced Marshmallows. The only tweak I would suggest is peanut butter instead of Walnuts. I can’t help it – I love Peanut Butter. Remember the Snow Queen serving Rocky Road Ice Cream in OUAT episode 4X03 “Rocky Road”? The U.S. celebrates National Ice Cream Month in July. California produces the most ice cream in America. Top-selling ice cream flavors are: vanilla, with 33 percent of the market, and chocolate, with 19 percent. Do you remember when Graham brought Emma Bear Claws in the episode “The Shepherd” 1X06? Back then I thought that it was a clue that they would introduce characters representing the Three Bears, but I was wrong. It would be years til we would be presented “The Bear and The Bow” episode. That’s the only Bear we would get. January 12th is National Glazed Doughnut Day. In the U.S. alone, more than 10 billion doughnuts are made every year. On of the more funny and awkward moments in Once Upon a Time (“The Cricket Game” 2X10) was when Emma and Henry (with all the fixings to make tacos) came into Mary Margaret’s apartment to find Snow and Charming (as Charming try to explain to Henry) helping each other to rest. October 4th is National Taco Day. Ensenada, Mexico is said to be the birthplace of the fish taco. One of the first taco trucks is thought to have started in New York when in 1966 two New York housewives operated an early version of the taco truck. Although the truck did not have a full kitchen, it was available for catering. One of the coolest things in Once Upon a Time Season 1 and 2 was when the storybook characters were introduced to things in our present day. For instance, on Belle’s and Mr. Gold’s first “date” at Granny’s (“The Crocodile” 2X04), Belle had her first hamburger and fries. 60% of sandwiches sold globally are actually burgers. Hamburgers are also known by the name “Liberty Sandwich”. This name was introduced by American soldiers during WWI because they wanted to avoid any German name. McDonald’s holds the record of selling 300 billion burgers till date. The company sells 75 or more burgers every second. Unfortunately, it is said that Granny’s lasagna isn’t quite as good as Regina’s. Maybe Granny should add some Red Pepper Flakes. Are you doing any Amazon.com shopping? Use our Affiliate Link here. Thank you. Remember when Zelena served Rumpel Meat Pie in “It’s Not Easy Being Green” 3X16? He mentioned the Spinsters used to serve it to him when he was a boy. The beginnings of the meat pie can be traced back to the Neolithic Period, around 9500 BC. The ancient Egyptians’ diet featured basic pies made from oat, wheat, rye, and barley, and filled with honey and baked over hot coals. These pies were eventually adopted by the Greeks, and it is there that a flour-water paste substance closely resembling pie pastry was created and was first filled with meat. In Greece, these pies were usually fried or cooked under coals. The Romans, tasting the delicacy from the Greeks, incorporated it into their own diet with little changes. According to the records kept by the wealthy, Romans used a variety of meats, oysters, mussels, lampreys, and fish as filling and a mixture of flour, oil, and water to keep it in. This ‘pastry’ cover was not meant to be eaten and was thrown away. Charming buys chili (without beans) for the dwarves as they dig in the underground caves in “Lacey” 2X19. Chilis most commonly used are jalapeno, serrano, poblano, yellow wax, birds eye, habanero, and cayenne. Chili peppers were used in ancient cuisines in Europe, the Caribbean, Asia, and the Middle East. A number of variations of chili have become popularized over the years. Texas-style chili doesn’t contain beans; vegetarian chili (aka chili sin carne) typically replaces meat with corn and other vegetables; chili Verde uses pork, tomatillos and green chili peppers in lieu of beef and tomatoes; and white chili uses white beans and chicken or turkey. This entry was posted in Once Upon a Time Blog on December 26, 2016 by Admin of Storybrooke ;). 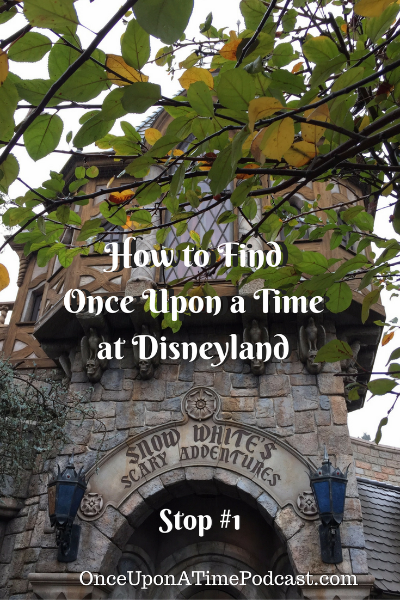 If you’ve wanted to know how to find Once Upon a Time at Disneyland, then this blog post is for you! 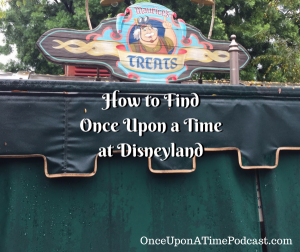 If you are a fan of ABC TV’s Once Upon a Time (like we are), you will enjoy a fun “treasure map” of how to find Once Upon a Time at Disneyland. So, put on your OUAT lenses and let’s hop over to Disneyland in Anaheim. Note: This post will always be updated. If you’ve spotted a representation of OUAT that we may have overlooked, PLEASE leave a comment letting us know. We need your to help. Thanks. 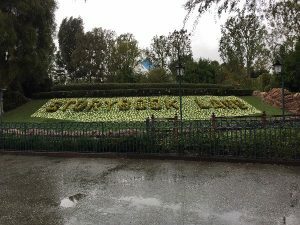 Let’s journey through Disneyland and find representations of ABC TV’s magical drama, Once Upon a Time. 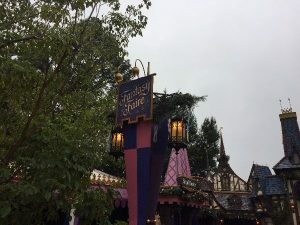 Our 1st stop is Snow White’s Scary Adventures in Fantasyland. This attraction is one of the few attractions that has been opened since the park opened. Originally, the ride did not depict Snow White. The idea was that the rider was Snow White experiencing everything first hand, but during the 1983 refurbishment, the Snow White figure was added as well as other modifications to the ride. If you touch the “golden apple” in front of the attraction you will either hear lightning crashing or the Old Hag cackling. 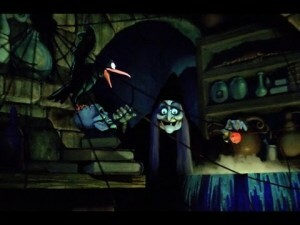 In this attraction, we see; Snow White, the Seven Dwarfs, and Evil Queen and the transformation to The Old Hag. Oh, and lots of apples. 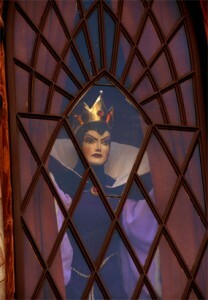 Don’t forget to look outside the attraction for the Evil Queen, because every once in awhile, she’ll be looking for you. Once geeky Once Upon a Time tidbit, in the audio intro while you are waiting in the line queue, you will hear the narrator use the word ‘dearie,’. Our second stop is Snow White’s Grotto. Hidden away on the path on the front eastern edge of Sleeping Beauty’s castle is Snow White’s Grotto. It features an anonymous gift from an Italian sculptor of Snow White, the Seven Dwarves and various woodland creatures. This issue was that all the human sculptures were the same height. To rectify the situation, the dwarves were placed closer to the viewers and Snow White was placed farther back. This would give the illusion of proper height for the characters. 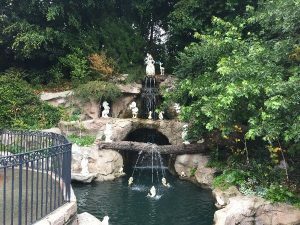 Also in the Grotto is a replica of Snow White’s ‘Wishing Well’. From inside the well, we can hear Snow White singing, “I’m Wishing (For the One I Love)” which is on a loop. Many have proposed marriage from that spot. I even considered it. Our third stop is Peter Pan’s Flight. This was another early attraction that gave the rider entry into the story (or in this case, the animated feature) of Peter Pan. 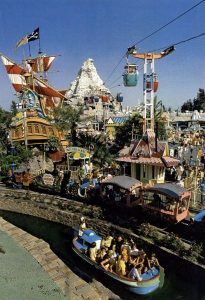 This was another attraction that was opened when the Disneyland park opened. Similar to Snow White’s Scary Adventures, the attraction did not feature a Peter Pan figure in the attraction until the massive Fantasyland renovation of 1983. Some believe that the location “draws” people to it. The location is the first attraction on the right in Fantasyland. People seem to almost always want to “ride the first ride” on the right. Prior to the massive Fantasyland renovation of 1983, there was a huge replica of the Jolly Roger in a small lagoon with Skull Rock toward the back. The pirate ship was officially called The Chicken of the Sea Pirate Ship and Restaurant and as you can guess, it was sponsored by Chicken of the Sea. 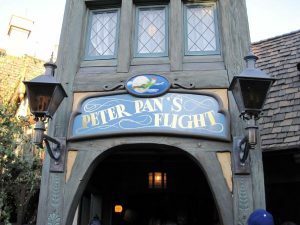 To tie this fact in with the Peter Pan’s Flight, some of the fixtures from the pirate ship were added to Peter Pan’s Flight after the renovation. Our fourth stop is Pinocchio’s Daring Journey. This “dark ride” showcasing the morality play about the saga of a wooden puppet becoming a real boy replaced the Mickey Mouse Club Theater in 1983. It has the feel of the other Fantasyland rides and fits in well. It uses older visual tricks like “Pepper’s ghost (Used a lot in the Haunted Mansion)” and newer digital projection technology was utilized to show the donkey transformation (used on Snow White’s Scary Adventures). Geppetto calling for Pinocchio during his search. This gets me every time. Our fifth stop is Sleeping Beauty Castle Walk-Through. Even though Disneyland park is “small”, the space in which its exists is used extremely well. Unless you knew wheat to look for, you might not even know this attraction existed. 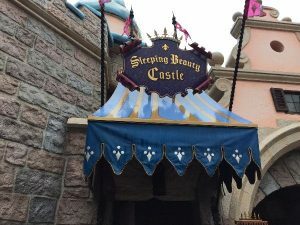 There isn’t a grand facade with ride vehicles announcing it, but indeed you can ‘walk-through’ the story of Sleeping Beauty in Sleeping Beauty’s castle. It is interesting that this attraction was the one that actually met one of Walt Disney’s goal of having a walk-through attraction (Haunted Mansion, Pirates of the Caribbean and the Alice in Wonderland attraction were all originally conceived as walk-through attractions). You feel like you are walking through the streets portrayed in the animated feature. As always, Disney’s focus on detail is everywhere. There are doorways, shadows, etc with fun visuals and sound effects that you need to pay attention and stay just a bit longer in certain areas to observe, interact with and enjoy. Oh, and there are stairs. Quite a few stairs actually. The story of Princess Aurora is laid out with passages from the ornate storybook leading to dioramas. The previous dioramas were cool, but also looked dated. The updated dioramas are great. The use digital projections to add magical elements and make it worth it to climb all those stairs. Our sixth stop is Alice in Wonderland. Have you ever wanted to fall into a magical rabbit hole and enter a magical land? You can in this Disneyland attraction that originally opened in 1958 in Fantasyland. You will see things like; the Red Queen in all her fury, an Un-Birthday party hosted by the Mad Hatter, a musical garden, smiling cats and more. Want more Alice wonderment? 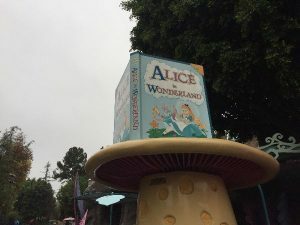 You can ride the Mad Tea Party ride right next door. I hope none of the cups are chipped, but they are fun. You may also want to buy a hat at the Mad Hatter. I’m pretty sure not of the hats are a portal to other OUAT worlds, though. Our seventh stop is Storybook Land Canal Boats. If you’ve ever wanted to a tour seeing miniaturized versions of homes of many of the most famous storybook characters that have been in many Disney animated features – from a boat, then this attraction is for you. 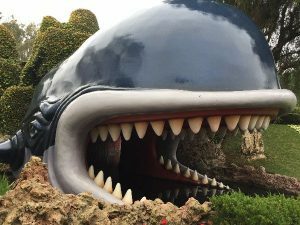 It also includes seeing what Pinocchio and Geppetto saw going into Monstro’s mouth, seeing the Cave of Wonders and more. If you normally pass this attraction by, do yourself a favor and take this ride next time. 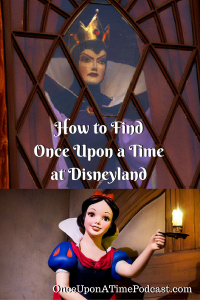 Our trek continues of How to Find Once Upon a Time at Disneyland. Our eighth stop is Fantasyland Fantasy Faire. This area once was the Carnation Gardens Plaza and it was a favorite place of mine to watch the fireworks show. Now, this is an area that resembles a storybook village that you can meet some storybook Princesses and see a show and dancing. Whether it’s Snow White, Cinderella, Belle or other princesses, this is where you might be able to meet them. The rotate the princesses that are available, but I would bet there is always on you’d love to meet. The Fantasy Faire courtyard. This is the main area with a magical Tangled tower that you must see in the evening. If you look around, you will see Figaro. The Royal Hall. Where you can meet the princesses that take time away from their adventures to meet you. The Royal Theater. Would you like to watch a fun re-telling of Beauty and the Beast, Frozen or Tangled? Would you? If so, then this is the place for you, lords and ladies. Oh and if your hungry or thirsty, you can visit Maurice’s Treats. Our ninth stop is Pixie Hollow. Picture the Fantasyland Fantasy Faire, but for Tinkerbell and her pixie friends. Meet Tinkerbell (or if she’s busy another pixie) and say hello in this shrunk down version of places just for pixies in the forest. Our tenth stop is Fantasmic show. Lighting up the Rivers of America since 1992, the incredible show Fantasmic! You will see many characters from Once Upon a Time represented here. This story of good, evil and Mickey Mouse’s imagination is a massive tale told on the original Tom Sawyer Island and in the waters of the Rivers of America. During the finale, the Mark Twain steamship (or sometimes on the strange on the old Tom Sawyer’s island) will be stock full of characters. They rotate who appears, so what I would suggest is to keep your eyes peeled as to which characters you will spot. Our eleventh stop is the It’s a Small World. We all know the song and the attraction. The cool thing is that during the 2008 refurbishment many new characters were added in their respective lands. That ends our journey of how to find Once Upon a Time at Disneyland. Stay tuned for our post detailing how to find Once Upon a Time at Disney California Adventure, and more. This entry was posted in Once Upon a Time Blog and tagged disneyland on December 18, 2016 by Admin of Storybrooke ;). Once Upon a Time Merchandise here (All products utilize Affiliate Links. We receive a small percentage of your purchase. Thank you for helping support what we do here.). Since ABC’s fun, fairy tale drama appeared on our TV’s on October 23rd, 2011 we have been enthralled by its story and characters. Whether you are an uber Oncer and have it all or a new Oncer, we have what you need. Make sure you take a look at all the Once Upon a Time Merchandise here. We know you will want to get some Oncer gifts for you or for your friends. In Season 1, we are introduced to Emma, Henry, Mary Margaret, David, Mr. Gold, Regina, Granny, Archie Hopper, Sheriff Graham and more. We watch as Emma steps into her destiny and unlock the mysteries of the residents of Storybrooke and their connection to their Fairy Tale Land selves. It was and always will be my favorite season. In Season 2, we continue the story of Emma finding the strength in herself as she battles new foes, including Regina’s mother, Cora. Hook also sailed into Storybrooke and we meet Princess Aurora, Prince Phillip, Robin Hood, Mulan, the Darling family and others. This entry was posted in Once Upon a Time Blog on December 10, 2016 by Admin of Storybrooke ;). The OUAT Winter Finale is here! 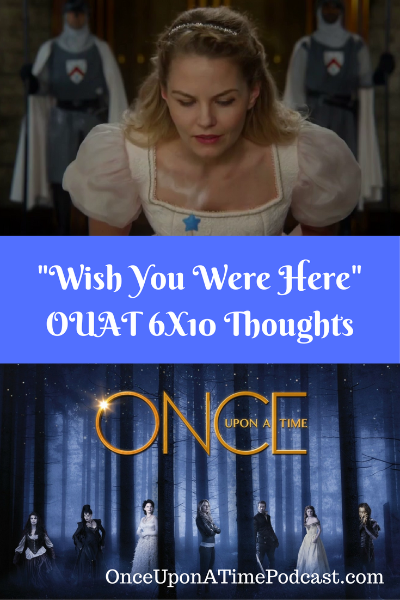 Welcome to our Once Upon a Time Wish You Were Here Review. We find out what life in (a parallel “dream” universe of) Fairy Tale land would have been like if Emma would have never been the savior. Henry is knighted and acts knightly. We learn the negative and positive aspects of the Regina and Evil Queen “connection”. The Dark Fairy kidnaps Gideon from the Blue Fairy and shows him the ‘Dark Side’. We learn that the hooded figure is Gideon and that he has the power to turn the Evil Queen into a metallic living Cobra (which I think looks a lot like Jafar’s staff, just sayin’). Belle and Rumpel will do what they can to rescue Gideon. As Regina and Emma use a bean acquired from Rumpel, Robin appears and the portal (which has a time limit) closes before that can use it to leave. Oh yeah, there are LOTS of Evil Queens, some real, some are cosplayed by Regina. 1. I hope they give Grumpy a raise. Grumpy does a very important job, warning towns/castles that danger is coming or is already there. It’s an important job, for sure. Now he’s hauling around a makeshift bird cage we hope has been retrofitted to keep a metal Evil Queen Cobra from biting him. All this danger he is constantly in is reason enough for a raise AND a date with Nova. Nova’s cute, remember? 2. The Mystery of the Red Jeweled Sword. Now, I think Emma is making a huge mistake. Belle is a fantastic researcher. She needs to find out what magic is infused in that sword that Emma is carrying around. I’ve mentioned before that I think that the red gem in it points to Jafar. If I’m wrong about that, the color red in nature means danger, so there’s that. I mean the Evil Queen drinks red Appletinis for heaven’s sake. Red is bad, people. Red is bad. Belle could research what the sword represents and how Emma can use the sword properly to destroy the hooded figure, but no Emma won’t ask her. Belle isn’t just another pretty face – or pretty legs. Emma, just ask Belle. Pretty please? C. Emma was humming ‘Someday My Prince Will Come’ frolicking in the forest. She’s a good frolicker. Seriously, she is. 4. Rumpel, I mean Gollum was great. In the ‘dream’ FTL, Rumpel sounded very much like the Rumpel we met way back in the Pilot. I thought it was more Gollum-like as well. 5. Tempting, isn’t it? Rumpel was back to his old tempting ways in the ‘dream’ FTL when he convinces Regina to “be evil (like she used to be)” to convince Emma that she is the savior. The script didn’t go the way I thought they were going with it. I thought Regina would begin to like her return to evil and want to stay that way. However, they played it for comedic value mostly. 6. Okay, what is it with Aladdin’s Magic Lamp? It now has a Genie attached to it with 3 wishes that will be granted. Why in the world didn’t the Evil Queen hide and/or protect it better than leaving it sitting around for anyone from Regina, Charming and Jasmine to walk around the Mayor’s desk and pick it up? I mean come on! Evil Queenie, I love you and your cleavage, but you need some more magical protection spell training. 7. Surrender? Really? Regina (posing as the Evil Queen) had to dig deep into her dark past to push Emma to use her magic. When we doubt ourselves and listen to the negative voice in our heads it can take difficulties in our lives for us to be who we really are. We all have gifts and strengths and we need to use them and refine them, not hold back. Many times in OUAT, we see characters accept and become who they really are or who they should be. I know, I know I’ve said it many times before. Regina is one of greatest characters on TV. She struggles, yes, but we also see her helping others and being second to allow others to be first. Even when she chooses to stay in the ‘dream’ version of Fairy Tale Land to be with Robin. What if we were in a similar situation and we found a loved one in a dream – we would definitely want to stay for awhile. Regina isn’t a squeaky clean 1950’s Superman, she is like us. She has good moments and bad moments. The key to life is not to be perfect, but to learn and grow in life. To me the reveal of the hooded figure was a bit like Scooby Doo, it was someone we knew briefly, but hopefully the ‘why’ will make sense. We still need to figure out if Emma’s vision will be true or not. Will the red-jeweled sword help or hurt Emma? I think it’s bad, but we’ll see. The one thing I think Adam and Eddy are setting up is Belle and Rumpel joining forces to free their son, Gideon. This storyline is similar to Han Solo and General Leia working together to help bring Ben Solo to the light side of the force. Two people fighting against a foe can create a bond, so we’ll see if this will bring Belle and Rumpel together. These are our thoughts, but what are yours? Leave them in the comments below. This entry was posted in Once Upon a Time Blog on December 6, 2016 by Admin of Storybrooke ;).